Clinton, the likely Democratic presidential nominee, in delivering the keynote speech at a Rainbow PUSH convention luncheon, said, “I am convinced the tide is turning” on “common-sense” gun control. Clinton blamed the gun lobby for working to prevent legislative votes. “They know what I know,” she added. “The vast majority of the American people” support stricter gun laws. The irony of Hillary giving this speech in Chicago, with its incredibly strict gun control rules, regulations, dicates, and laws, is breathtaking. 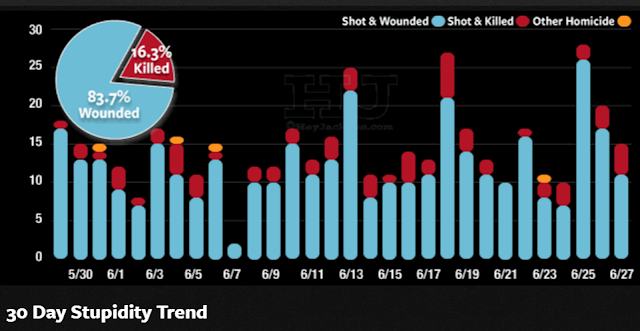 And that was just through yesterday, including the 4 killed, 11 shot in Chicago Monday. All this gun control is working wonders in Democratic Party run areas like Chicago, Detroit, Baltimore, and California, among others, wouldn’t you say? Of course, Hillary doesn’t worry, because she is surrounded by people carrying guns, including ones that are illegal to own by citizens. A short segment of Hillary's speech was not reported. These comments were off-prompter and were declared non-existent. My report of it here is limited to being fake but accurate. Hillary: Let me speak briefly about auto accidents as another cause of mass death. For too long, any ordinary individual can take a short course in driving, borrow or buy a car with no background check, and immediately control a 4,000 lb instrument of death. That individual thinks this supports a better life, and even drives this car just for the fun of it, if you can even contemplate such a dangerous impulse. The result is about 130 people killed each day and about 500 more injured, including Sundays. A little psychopathic "fun" and a claim that driving supports a better existence can no longer excuse the mass death arising from amateur driving. Most people have no compelling need for a car. They could arrange their lives to work and live within a walk or bicycle ride from work, or use the wonderful public transportation which we provide and would provide more of. Their real happiness comes from belonging to a community, not in arranging their own, amateur transportation. This is properly provided by professionals in state and local government. I have not driven a car in 20 years. They scare me. I do have trained, licensed drivers who provide me with transportation services, but only as a necessity of my busy life and heavy responsibilities working for you. I have no desire to eliminate driving or take your cars from you, but these should be handled by trained, licensed, professionals. Remember that if you should need personal transportation provided by a car, one is available in only minutes, driven by a professional who will avoid the tragic accidents that you would have if you drove personally. Let's have common sense rules about car ownership and personal driving. Cars are much more dangerous to you than any supposed benefits they give. You can't spend any extra income if you are killed by the instrument of death which is supposedly providing that extra security. Worse, you may be killed by some other amateur. Even worse, you may be killed by a criminal with easy access to a car, who runs you down without a thought, drunk with power. This is only common sense. Driving is not even mentioned in the Constitution. It is a privilege and not a right, a privilege which must be tightly controlled to build a better, safer society.